This non-detergent gel cleanser is formulated with soothing Cucumber, hydrating Aloe Vera and Thyme - a powerful natural anti-bacterial, which helps to minimise excess oil and breakouts. It thoroughly removes all face and eye make-up whilst balancing and cooling the skin. For normal, oily and combination skin types. Dampen face and apply cleanser. Massage over the entire face and remove with a warm damp face cloth. Gentle enough for use on the delicate eye area. Can also be used as a shaving gel for men. Aqua, PEG-7 Glyceryl Cocoate, Aloe Barbadensis Leaf Juice, Glycerin, Polysorbate 20, Phenoxyethanol, Caprylyl Glycol, Cucumis Sativus Extract, Acrylates/C10-30 Alkyl Acrylate Crosspolymer, Potassium Hydroxide, Disodium EDTA, Thymus Vulgaris Extract, Parfum. This cleanser is amazing cleared my sons spots up in just one week his skin has never looked so clear. I love this product I just got another bottle. I use it daily and I hardly ever get break outs, feels amazing rubbing it into my skin and my skin feels soft. I have been using cleanser over a year. I had mainly used foam cleansers before so the gel took a little time to get used to but i love it. I use it both in the morning and at night before bed. i bought this product because i needed a make up remover.. and it does remove make up well but to get best result is using the daily clear cleanser after using the triple action cleanser. it soothes my skin! I really loved this cleanser and the fact that it doesn't foam. My skin always feel clean and fresh after using this product! 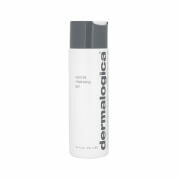 Love this cleanser, cleans the makeup off without being harsh on the skin. I use this morning and night. The fact that it doesnt foam took a while to get used to, but other than that its perfect. It takes all left over make up off my face and doesnt dry out my skin. Ive noticed clearer skin with just a few uses.